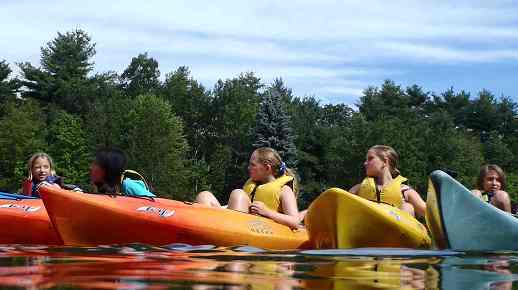 The Tom Denney Nature Camp is a unique summer day camp held in Bolton’s Bowers Springs Conservation Area. We welcome children entering Kindergarten through High School, and from all towns. Registration opens February 1. Click HERE to register. Tom Denney Nature Camp was founded in 1976 and is sponsored by the Bolton Conservation Trust. Our dedicated and enthusiastic staff supports Bolton’s commitment to environmental education and to kids. Here, children develop understanding, respect and responsibility for the environment while growing as individuals through creative play, exploration and physical skill building. Activities include games in the woods and fields — Predator & Prey, The Amazing Race, Mystery Animal — swimming, tracking, hiking, exploring, arts & crafts, songs, campfires, shelter building, meeting animals from the visiting Animal Adventures program & more. 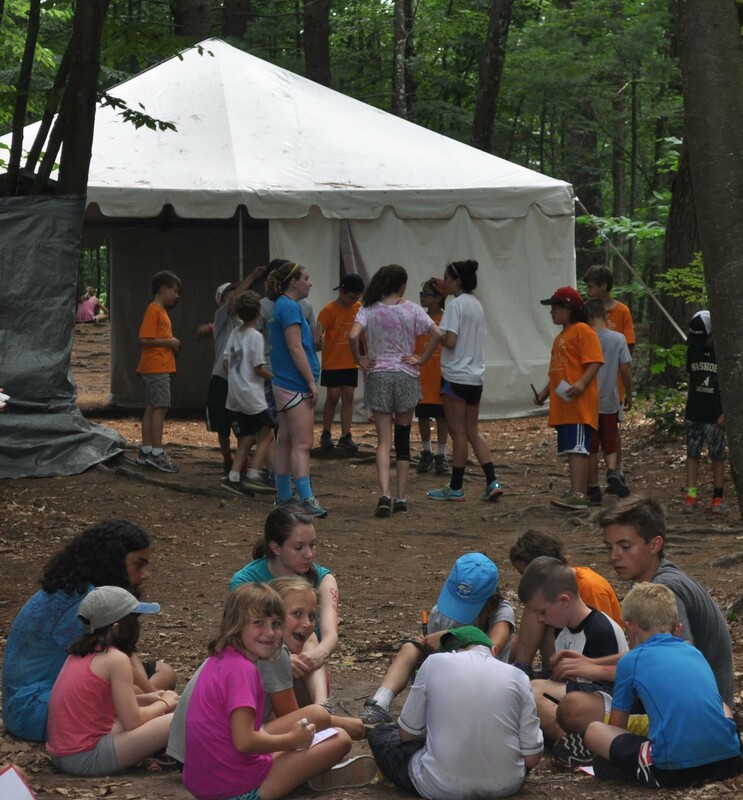 Activities include kayaking on the pond, playing laser tag in the woods, sleeping overnight (Thursday) in the big tent and playing nighttime games and roasting marshmallows, going on an adventure hike & more! Campers this age may choose this program or the TDNC program. Applicants for Counselor in Training must be entering 9th grade or above. CITs must attend a mandatory 3 day Orientation and work a minimum of 2 weeks. CITs work on responsibility, leadership, team building, communication, skill development and personal growth, so that they can gain confidence and independence for wherever their future takes them. Do it with your friends and have fun! The camp day is 9:00 and – 3:00 pm. We play in the rain! Camp is only canceled if there is thunder/lightning. Morning all-camp game — We start every morning with a running game in the field, because, why not! Morning Circle — We like to gather on the logs at Camp Circle and do some stretching, sing a few songs and introduce Mystery Beast Clue #1 before breaking into groups. Morning Group Time — Mondays we form our groups according to age and each group votes on a name. Although we have our assigned groups, we also do many all-camp things and re-organize into other groups for variation. We review the upcoming day and get the count for free choice. Each group also works on the skits they will perform at the end of the week for families and friends. Snack — Who doesn’t love snack time! Tracking: Your counselor is lost in the woods and you need to find them while not falling for misleading clues! Habitat Rush: Which safe spot do you run to according to what the animal is — and make sure not to get out! Amazing Race: Work with your group to get through the Poison Ivy Patch (not a real one! ), Swamp Pit (not a real one! that’s for later), Over/Under/Through, Log Shuffle and brain teasers. Team Building: Whichever group works best together to solve puzzles like Human Knot gets an advantage for Shelter Building. Scavenger Hunt: What can you find in nature? Running games — sometimes campers just want to run some more, so we’ll play Sticks/Capture the Flag, Camouflage, Kick the Can, Stampede/Sharks & Minnows, Tennis Ball Game, and more. Predator and Prey: An all-camp *favorite* game of tag where you are with a group of animals in the food chain and you have to find food, water and shelter, while tagging those in the food chain below and avoid getting tagged by those in the food chain above you. Animal Adventures: Animal Adventures staff bring exotic and local animals for campers to learn about and touch them. Past animals have included: rabbits, turtles, snakes, alligators, ferrets, chinchillas, foxes, lizards, porcupines, skunks, frogs, beetles and more! Shelter Building: Another camper favorite… work with friends to build a lean-to shelter that will be judged on how well it protects you from our water test. Performance: On Friday, perform the skit or song your group has prepared for families and friends, as well as enjoy a treat. Afternoon Group Time — Write or draw in your journal about the day to share with your family and friends the fun you’ve had at camp. Closing Circle — Mystery Beast Clue #3 and drumroll for answer. Closing song. Special Activities — We think all of our activities are special, but we also like to kick it up a notch and add things like Spirit Days (come dressed for camp in a theme) or Color Wars (each group comes dressed in one color and can wear face paint). Rainy Day Activities — We play in the rain! Almost everything we do can be done in the rain. Some games are even better in the rain, like Slide Tag! The canopy of trees in the woods protects us from most of the rain, but we also have a big tent if we need it. Our CITs do everything with the staff and camp; they play games and do activities while helping to keep the campers safe. Our staff does everything with the campers. We couldn’t keep them from playing the games! Each staff member completes a file with health and legal records, CORI/SORI, concussion training and recommendations. All staff attend a pre-camp training and orientation. The first thing they learn is the camp motto: Safe, Fun, Nature! Lifeguards have lifeguarding, First Aid and CPR certifications. The Camp Health Care Consultant reviews all our policies and procedures. The Camp Inspector reviews all our staff and campers’ files, facilities, and policies and procedures. TDNC complies with the regulations of the Massachusetts Department of Public Health and is licensed by the Town of Bolton Board of Health. If you have questions, please contact the Bolton Conservation Trust. The fastest way to receive an answer back from the Trust is via email at moc.l1556137352iamg@1556137352cndtt1556137352cb1556137352 and we will either email you back or you can leave a phone number and we will call you back. Otherwise, feel free to leave a voice mail message only at 978-429-3004. The Bolton Conservation Trust is a non-profit 501(c)(3) organization and offers scholarships.